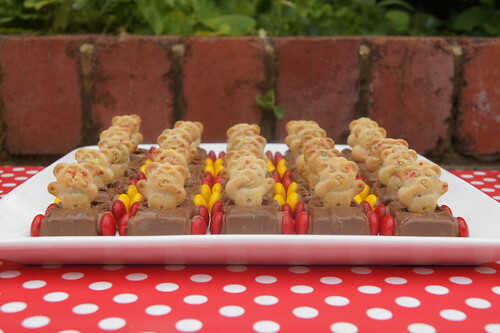 This is a more recent version of the cars I made for a Winnie the Pooh themed birthday party which you can see in full here. Last year I posted on how to make Tea Cup Biscuits. A gorgeous little treat for children’s birthday parties and the like. Since making these I have been asking around for a more boyish alternative to make for my sons’ birthday parties. I was very lucky to receive a text message from my friend Belinda one afternoon. Belinda was at a boy’s birthday party and she sent me a photo of the very cute Milky Way Cars. This was just the thing that I was after – so props to Belinda for the idea. 2. Melt the choc melts in a small dish. I use the microwave and start with 30 secs, checking the texture and heating again for short bursts until melted. Thanks to Lou for the tip on using melted chocolate to stick on the beanies. First time around I tried icing sugar mixture and it was not successful. 3. Using a thin object (I used a chopstick), place a small amount of melted chocolate onto the beanie and then stick the beanies to the bar. 4. Holding the bar by the sides, press the tiny teddy gently into the bar. 5. Repeat until you have completed all bars. Very simple, very cute and very tasty! Melt the choc melts in a small dish. I use the microwave and start with 30 secs, checking the texture and heating again for short bursts until melted. Using a thin object (I used a chopstick), place a small amount of melted chocolate onto the beanie and then stick the beanies to the bar. Holding the bar by the sides, press the tiny teddy gently into the bar. Repeat until you have completed all bars. Very simple, very cute and very tasty!